Although there was an optional theme of Christmas,I am still into Spring mood that I decided to make another Spring Card. The adorable digi is from Lily-Boo's Boutique. Just a quick post to share a card I made yesterday. I used the free image from Katherine at Countless Joy. She was inspired by her daughter to create this image. Isn't that lovely?? 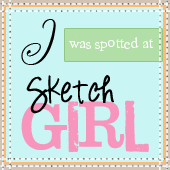 I used the sketch over at Delightful Sketches. Hope Katherine and Kathleen likes and you all like it too!! Onto the card, I tried faux frosting technique for the first time with this one and look at me I frosted the hearts....lol Although I need to practice frosting a bit more, I liked the way it turned out. I used pearl colors to color the hearts. And here is how the inside looks. Card Positioning Systems #158 (Sketch) Totally Gorjuss #22(Ribbons) ABC Christmas Challenge (F for Frosty) The Crazy Challenge (Simple and Elegant) Hope you like it!! Thanks for visiting!! Good Morning people!! Woaaah its saturday...........day to relax and craft!! I just love it :) This card screams SPRING :). I had not used green and pink for a while so just thought of going with it this time. I crushed the green paper to give a little effect. The plaid white background has been created using crayons. (The poor girl that I am, I dont own any pattern papers yet...so I create my own each time :) ) . The pink checked background came with my fruit packaging (So to say that my waste master instincts have returned with this card....lol). The flowers have been painted using water colors.I have popped up one of the flowers to give a 3D effect, I am not sure if its visible in the picture. Isn't it lovely?? Well, its definitely one of my favourites. Here is the third one to be shown to you all. The monocromatic free digital image is from Digital Doodling. I used some felt pieces from Creative Impressions for this one. The free digital image is by Kim MacFarlane and I just love these cutie elephants. I wanted this to go for Cute Card Thursday Challenge #103 - Celebrations also but I am a bit late. Nevertheless I hope they visit my blog and atleast leave a comment. Hopefully I will make it in time for the next one. But I really missed the blogland and now it feels great to be back to this amazing world of creativity. This card is pretty simple. I have used my embossed offwhite sheet for the background. Flower is a free digital image available at Bird Cards which I colored using water colors. Greens Brads are from Basic Grey. The background has been painted with free hand and flowers are ofcourse from Joanne's Mainly Flowers blog. They are not as good as hers though :). I tried to do something on the inside of this card and here is how it looks. I wanted to match the flowers on the front so I hand painted them. Back again with another card :) Weekends are the days when I actually satisfy my crafting desires :)) The cute asian tilly is a freebie from Digital Doodling. .....aaahhh finally I can tell you atleast one freebie site :)) . Go and check out, they have some amazingly cute digi stamps to offer. I love the color combo. Its so bright and chirpy. The picture isnt too good I guess because I have the feeling that it looks prettier in real :). The background strips are hand painted and the satin flower is handmade. I have tried to combine a few challenges with this card. Crazy 4 Challenges C4C27 (Pricking). Hope you like it !! Thanks for visiting!! Happy Saturday !! Here is quick card for CPS Sketch 156. I told you I loved the sketch completely and had so many ideas floating around in my head. The pretty yellow pattern paper had been lying unused with me for over an year. So thought will put it to use this time. The buterflies are free digi stamps colored using water colors. The picture isn't really great. Hope you can bear with it :) I will get to the details later. Good Morning!! Wishing you all a great day ahead !! For me friday is the best day of the week :)) . Hope its the same for you too. The card uses a lot of shades of green. The frogs are hand drawn and colored and are very adorable. The sentiment is without a doubt handwritten. This card here is based on the CPS Sketch 156 and some other challenge had the color theme of black and white. And again as usual I have forgotten which challenge blog. You must be habitual of my gold fish memory by now :). I loved this sketch at CPS. Its very simple and elegant and there is a lot that can be done with it. I prefered to keep it simple this time. The pattern on the small square is hand drawn. The border has been done with a glitter pen. The beautiful black ribbon is from Creative Impressions. You have to believe it when I say that I have literally been spending half my salary on craft's supply :)) .